LCR Hallcrest is pleased to announce the expansion of the Digitemp EZ product line. Digitemp EZ, featuring single color change technology, is now available in 9 self-adhesive sizes covering a temperature range of -30 to 90⁰C that is easy to read and continuously displays temperature with no batteries. LCR Hallcrest is pleased to announce the expansion of the Digitemp EZ product line. Digitemp EZ thermometers indicate the current temperature with one color. No Interpretation Necessary! Same features and benefits as traditional liquid crystal thermometers in an easy to read format that offers limitless custom possibilities. 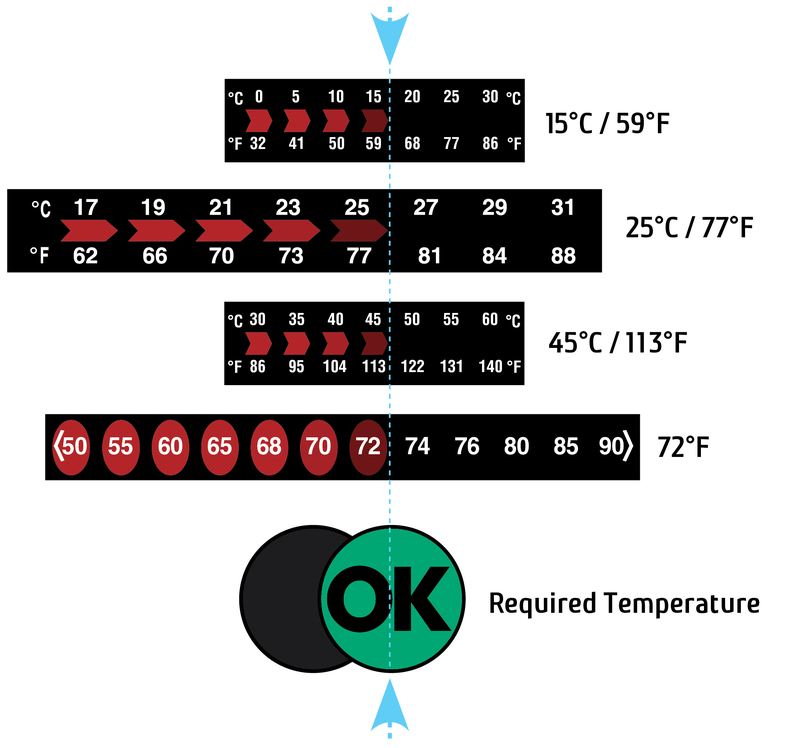 Digitemp EZ, featuring single color change technology, is now available in 9 self-adhesive sizes covering a temperature range of -30 to 90⁰C that is easy to read and continuously displays temperature with no batteries. Single color change liquid crystal is digital in nature and works like an on/off switch, allowing the technology to be applied to custom graphics. Symbols, numbers, letters, and images can be made to appear when an activation point is reached. Triggering points can be mixed to create indicators that monitor a temperature range, High, Low and OK can be combined in one indicator. “We have increased the standard product line and temperature range in reaction to strong demand for the Digitemp EZ read concept. This increased demand for standard thermometers is also generating an escalation in custom requests.” comments Rocky Sapienza, VP of LCR Hallcrest.